Paramount Pictures has released the first trailer for Ben-Hur, which is directed by Timur Bekmambetov (Night Watch, Wanted, Abraham Lincoln: Vampire Hunter). The movie stars Jack Huston (Boardwalk Empire, Pride and Prejudice and Zombies), Toby Kebbell (Dawn of the Planet of the Apes, Warcraft), Morgan Freeman (The Shawshank Redemption, Se7en), Rodrigo Santoro (300, Love Actually), Nazanin Boniadi (Homeland, The Next Three Days), Ayelet Zurer (Daredevil, Man of Steel), Sofia Black D’Elia (Project Almanac, The Messengers), Pilou Asbæk (The Borgias, Lucy), and James Cosmo (Game of Thrones, Braveheart). You can read more about Ben-Hur and watch the trailer below. Though it’s assumed by many that this is a remake of the 1959 classic of the same name that starred Charlton Heston and won 11 Academy Awards, including Best Picture and Best Actor for Heston, it’s actually a new adaptation of the original 1880 novel Ben-Hur: A Tale of the Christ by Lew Wallace. Like other classics (The Wizard of Oz, The Maltese Falcon just to name a couple), the ’59 Ben-Hur wasn’t the original adaptation either, with a silent film production in 1925 and a much smaller adaptation in 1907 coming before it. Now, whether or not this new take on the story will be good or not? That’s something to be determined on another day. The movie is scheduled to be released on August 12th. 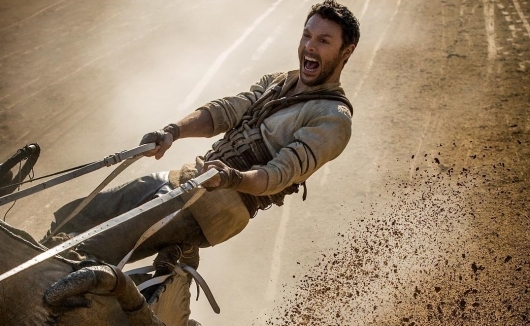 Watch the movie trailer for BEN-HUR! Coming to theatres August 12, 2016.